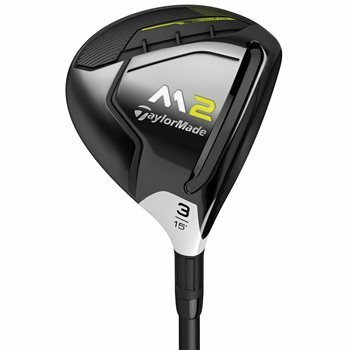 The TaylorMade M2 2017 fairway woods were engineered to deliver exceptional distance and forgiveness with multi-material construction. The 6-layer carbon composite crown allows for a low CG that combines with a longer, more flexible, and open-channel Speed Pocket for world class performance from the tee and off the fairway. The M2 2017 fairway wood also features Inverted Cone technology, for the first time ever in a fairway wood, which protects ball speeds across the entire clubface for a larger sweet spot. The M2 also has a fluted hosel design that provides superior sound and feel without compromising distance. Review by Matt, 1 year ago. Review by Bob, 1 year ago. Review by Steve Baker, 3 months ago. Review by Five stars, 4 months ago. Review by dave, 2 months ago. I ordered a used M2 fairway wood. Does it come with a club.cover. Used clubs do not come with a headcover. What does HL after a club desinate? Difference between re*ax65 and reax65 shafts? They are actually the exact same shaft. Two different clubs were just received slightly different.